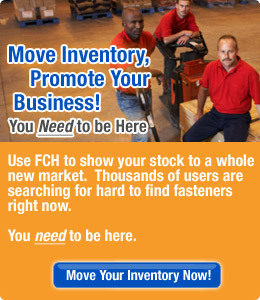 At The FCH Sourcing Network you will find hundreds of thousands of fasteners within our database of surplus, odd lot, slow-moving and hard to find fasteners that conform to the ISO specification. Bolts & Cap Screws by ISO Specification - Hex bolts and hex cap screws feature a large fastener head for distributing clamping load. These fasteners are used at high tensions and temperatures. Cap screws have a washer face underneath the head and are used in precise applications. In Europe, a cap screw refers to a bolt-type fastener that is fully threaded, whereas a bolt is the part-threaded equivalent. Keys by ISO Specification - Keys are shaped pieces of metal, pins, bolts, or wedges inserted into a hole or between parts so as to lock the parts together and stop them from movimg relative to each other. Nuts by ISO Specification - Nuts, or mating fasteners, are available in hundreds of different shapes and sizes for any project or application. Varieties are normally hexagonal or square in shape, and have either coarse or fine internal threads that correspond to those of a mating bolt or screw. Pins by ISO Specification - Pins are available in many varieties for specific jobs where additional strength is required to secure materials. Rivets by ISO Specification - Rivets are fasteners used to permanently hold two pieces of material, usually metal, together. In general, riveting involves placing the shank of the rivet through a specific-sized hole in two or more materials. Screws by ISO Specification - Screws are one of the most versatile, useful types of fasteners, and are available in multiple sizes and styles. In different countries, and in different industries, there is some confusion in the distinction between screws and bolts. Some definitions of screws include the requirement that they be fully threaded, and these may also often be called Bolts. Washers by ISO Specification - Washers fit under the head of a fastener in order to increase the hold of the fastener or to increase the bearing surface. Pipe & Tube Fittings by ISO Specification - In general, the difference between tubes and pipes is in how they are specified. Tubes are generally specified by their outside diameter, and pipes are usually specified by their inside diameter. Fittings are the connectors (Elbows, Crosses, Tees, etc. ), that are used to join segments together or to interface with them. Hand Tools by ISO Specification - Hand tools are any tools that are manipulated by hand rather than by a powered tool. Categories of hand tools include wrenches, pliers, cutters, striking tools, struck or hammered tools, measuring tools, screwdrivers, saws, and knives.